"Heed the words of Pope Francis to stop warmongering, protect Mother Earth and end income inequality. If our elected officials fail to heed the pope’s warnings, our planet will continue to suffer irreversible and deadly consequences." WHO: Members of the National Campaign for Nonviolent Resistance (NCNR) have been speaking out against the illegal actions of the United States government since 2003. They have organized numerous actions across the country involving nonviolent civil resistance as they call attention to the crimes of our government. For example, on April 22, 2015 [Earth Day] they gathered first at the EPA headquarters, and second at the Pentagon. At the Pentagon, eight of them were arrested when they requested a meeting to discuss the military’s role in climate chaos. WHAT: More recently, members of NCNR wrote letters to Rep. Paul Ryan and President Obama [these letters are available upon request] seeking meetings to urge them to heed the call of Pope Francis to make drastic policy changes to bring about real change in ending war, poverty, the climate crisis, and systemic violence. However, there was no response to either letter, so twenty citizen activists first went to the Longworth Building to go to Ryan’s office and later close to one hundred activists gathered at the White House. This was part of the week of actions called for by Campaign Nonviolence with over 325 actions around the country between September 20 and 27. Just prior to the historic visit of Pope Francis, who was to arrive that day at 4 PM, after the visit to Congress there was a rally first in Edward R. Murrow Park and another on Pennsylvania Avenue in front of the White House. Amidst heavy security, speakers challenged the issue of Islamophobia, nuclear weaponry, fossil fuels, global inequality, corporate control of governments, climate chaos and the attack on polar bears, killer drone strikes and other issues in which our government is complicit. During the White House rally some twenty-five of the citizen activists went to the visitor’s entrance to the White House to seek a meeting. After their request for a meeting was rebuffed, many of them sat down in solidarity with the world’s suffering. While sitting there, they noticed many people including members of the media, a climate delegation from France and other officials did get through to the White House. Members of the French delegation were very supportive of the sit-downers, and took copies of the letter sent to Obama. Since people were entering through this gate, some of the activists got in line. Again they were rebuffed, and eventually fifteen of them were arrested by an inefficient force of Secret Service officers. Besides being incompetent—Max Obuszewski was frisked three times and had his socks removed on Pennsylvania Avenue—the officer mistreated some of the activists. At 10 AM, the delegation at Ryan’s office discovered the door was locked. On the door was a sign “Entry restricted to those with an appointment.” Since a letter was sent requesting a meeting, we knocked and Rebecca peeked out. She said we cannot enter. After some discussion, the activists left bags of seeds of hope and articles about Ryan’s disastrous Republican budget, and then taped messages on and around the office door. Great displeasure was expressed that citizens were denied the basic courtesy of entering the office of a member of Congress. Before going to Murrow Park, some of the group went to Rep. Mark Pocan’s office and received a warm reception, which included food and drink. NCNR selected Ryan’s office, as he is representative of all that is wrong with Congress, with their disregard for doing what is in the best interest of the people of the United States and of the world. At the noon RALLY in Murrow Park, 1800 block of Pennsylvania Ave. NW, some of the speakers were Marie Dennis of Pax Christi and Sister Megan Rice of the recently-released Transform Now Plowshares. Then the gathering marched on Pennsylvania Avenue to the White House, while Art Laffin, of D.C.’s Dorothy Day Catholic Worker, sang SINGLY NONE. Around 1 PM there was a bevy of speakers including the Rev. John Dear, Campaign Nonviolence, Kathy Kelly from Chicago’s Voices for Creative Nonviolence, the writer David Swanson, Code Pink’s Medea Benjamin, Ellen Barfield, one of the fasters outside the Federal Energy Regulatory Commission, and others. Each one had an unique perspective on the ills of our government. During the rally a group implored the Secret Service to facilitate a meeting as requested in the NCNR letter. Instead the officers informed the delegation, there was a need for an appointment. Again we were confronted by Catch 22. We request an appointment, receive no response, and then we are told we need an appointment. It was almost inevitable that the citizen activists who believe strongly in their right to petition the government would be arrested. Those taken into custody were as follows: Joe Byrne, Baltimore’s Jonah House, Don Cunning, Carol Gay, Mary Ellen Marino and Manijeh Saba, all from New Jersey, Joy First and Phil Runkel, from Wisconsin, Kathy Kelly, Art Laffin, Malachy Kilbride, a Maryland Quaker, Joan Nicholson, a Pennsylvania Quaker, Max Obuszewski, Baltimore, D.C.’s Ellen Taylor, Brian Terrell, Iowa, and the venerable Eve Tetaz in a walker, Washington, D.C. They were charged with disorderly conduct and are scheduled to be arraigned on October 15 in D.C. Superior Court. Many of them will go to trial to challenge a government which refuses to meet with them, and instead has them arrested. They were arrested around 2:15 PM, and were not released until about 9 PM. As the pope was greeted, the defendants were stuck in a D.C. jail. It is presumed that the pope will not be informed that U.S. dissidents were also jailed, like those in Cuba. 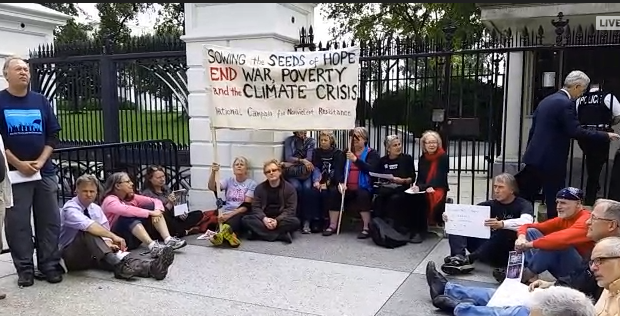 They came to Washington to call on our government to heed the words of Pope Francis and to stop the warmongering, protect Mother Earth and end income inequality. If our elected officials fail to heed the pope’s warnings, our planet will continue to suffer irreversible and deadly consequences. Kelly recently returned from meeting children in Afghanistan. WHY: Under the banner of Campaign Nonviolence, thousands of U.S. citizens across the country are taking a public stand against all violence in a movement for a culture of peace and nonviolence free from war, poverty and the climate crisis. Swanson, from World Beyond War, spoke about the need to take immediate action, stating, "As the climate crisis moves beyond reversibility and the war-made crisis of the Middle-East continues to be worsened by governments seeking to fix it with more war, we cannot afford to take a year and a half off for election-distraction. The world needs radical change in Washington right now." Kelly said this, "The Obama administration bears responsibility to educate the U.S. public about the greatest terrors we face, - the terrors of what we are doing to our own environment. Not one dime of U.S. resources should ever again go to war profiteers, war planners, and Pentagon exploits. Instead, those resources should be used to alleviate the impact of climate change and to meet human needs within the U.S. and beyond." Campaign Nonviolence is a grassroots movement to mainstream active nonviolence using the vision of Martin Luther King, Jr. that calls us to become people of nonviolence and to resolve personal and global conflicts nonviolently. For information on Campaign Nonviolence contact Ryan Hall atinfo@paceebene.org or 510-268-8765 or www.campaignnonviolence.org .